I have just picked some fresh cucumbers from my garden…..they are so fresh, and so much tastier than the ones from the store (no wax on these babies….). Garden fresh cucumbers actually do have a very nice taste, and can be eaten with the peel on, but I prefer them peeled. Cucumbers may be used in a variety of ways: in tossed salads, as cucumber tea sandwiches, sliced and served plain or with a dip, used in numerous appetizers, etc. 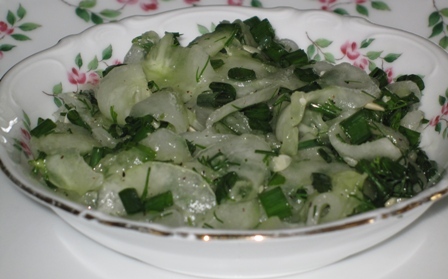 I love my cucumbers in a cucumber salad, dressed with sour cream, or vinaigrette style. Peel the cucumbers, and slice thinly (you can also use a food processor, or grater). Add 1 tsp. salt, mix, and place in a colander for 15 minutes to drain. Place the drained cucumber slices in a bowl. Mix in chopped onions, dill, and vinegar. 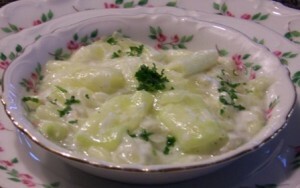 Cucumber salad is best served as soon as the sour cream is mixed in, otherwise it will begin to get watery. I use Light Sour Cream, or Oikos Greek Organic Yogurt, for lower calorie count, or Italian Dressing, for the vinaigrette style. How timely! I just had this salad for lunch! DELICIOUS! Great! Ethan and I picked 14 cucumbers yesterday. I’ll make this today. Today was a perfect day for some cucumbers……to cool off on this hot and humid day. Wow….14 cucumbers….that is a nice pick. Have fun with the salad. I also used to cut up some cucumbers and put them in the left over brine from Claussen Pickles, keep them in the fridge, and in a few days I would have pretty good tasting, mild flavored pickles.